Want career success? Practice gratitude. Desire happy relationships? Practice gratitude. Striving for health and fitness? Practice gratitude. Seeking spiritual enlightenment? Practice gratitude. This is my year of gratitude. And as any astute 21st century writer, I turned to Google to get the facts. Gratitude is a virtue, a practice, a reward, a measure of a person, the source of wealth and abundance, the foundation of all that is good. The values and philosophies of the East and the West often seem at odds, but they meet at the intersection of gratitude. The Buddha, the source of wisdom, virtue, and enlightenment arising from the East said, Let us rise up and be thankful, for if we didn’t learn a lot today, at least we learned a little, and if we didn’t learn a little, at least we didn’t get sick, and if we got sick, at least we didn’t die; so, let us all be thankful. From the West, we find Epictetus, a Greek philosopher of the Stoic school. He taught that, He is a wise man who does not grieve for the things which he has not, but rejoices for those which he has. We would not think a king of capitalism and a talk-show queen have much in common but they share the throne of gratitude. Charles Schwab, grew up in Californian affluence and founded a leading banking and brokerage firm. His advice shows the importance gratitude plays in creating a successful business, The way to develop the best that is in a person is by appreciation and encouragement. Although her life began with poverty, abuse, and struggles, Oprah Winfrey used gratitude not only to amass wealth but also to become a personality admired world-wide. Be thankful for what you have; you’ll end up having more. If you concentrate on what you don’t have, you will never, ever have enough. But, it is from those who understand that gratitude sweetens every moment do we see how gratitude is the key to open doors to a fulfilling life. Gilbert Keith (G. K.) Chesterton was an English writer born in the late 1800s. In his lifetime he became known for his books, particularly a detective priest series. He also was a leader of the Distributist movement that supported the idea of providing small amounts of private property to all citizens. But in his twenties he experienced a deep period of depression which he eventually overcame. His understanding of gratitude was key to his later accomplishments. I would maintain that thanks are the highest form of thought; and that gratitude is happiness doubled by wonder. Injustice, oppression, racism and war shape a person’s life in unplanned ways. Dietrich Bonhoeffer grew up in the large family of a leading psychologist in Germany. In 1931, he was ordained a Lutheran minister. Three years later he joined other Lutheran pastors to form the Confessing Church, a free church not controlled by the Nazi party. But in 1937, the Nazis outlawed the Confessing Church. Bonhoeffer’s writings, eventually compiled in a book called “Ethics,” reflected his opposition to the Nazi government. That opposition culminated in his decision to participate in an effort to overthrow the government and assassinate Hitler. The plot failed and the conspirators were caught. Unfortunately Bonhoeffer was executed 21 days before Hitler committed suicide. His life experiences and spiritual beliefs, grounded in compassion and courage, led Bonhoeffer to acknowledge the value of gratitude. In ordinary life, we hardly realize that we receive a great deal more than we give, and that it is only with gratitude that life becomes rich. Kidnap, abandonment, sexual abuse, and addiction were traumas Melody Beattie survived in her childhood and youth. During a drug treatment program, a spiritual experience turned her life around and she never returned to addiction. But her troubles were not over. She overcame the betrayal of her husband, who continued his alcoholism secretly and left her in debt, and later the death of her 12 year old son. Beattie wrote about her experiences, defining codependency, and has inspired millions to find the means to overcome troubled pasts and grief. Gratitude was vital to helping her attain a life of balance and happiness. Gratitude turns what we have into enough, and more. It turns denial into acceptance, chaos into order, confusion into clarity…it makes sense of our past, brings peace for today, and creates a vision for tomorrow. So, we see that from the spiritual to the financial worlds and all in-between, gratitude provides a foundation for fulfillment, balance, and happiness in life. 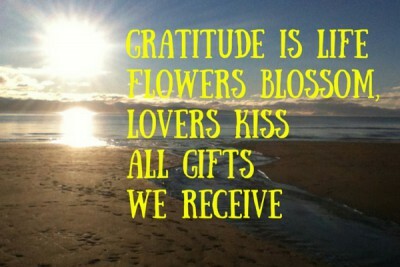 If you want to explore the benefits of creating a simple gratitude practice, Click Here. I Love the “Gratitude” posts. You are so on point with all the examples of being grateful foe all we have and can do. Life is a journey and blessing. Grateful for all you do! This is powerful and I’ll be sharing it! I’m fortunate in that I’ve always practiced gratitude without even knowing it. You see, I’ve almost never found anything to complain about; always been happy for the ways things were. Over the years, I’ve become more sophisticated in expressing gratitude by verbally expressing it while alone for every little thing, such as a crisp, sunny, winter’s day, or fresh water to drink. I have also found that it is wise to keep a journal which encourages me to think of the things I take for granted as being the most important things to be grateful for. For instance, three beautiful loving sisters, the experiences we shared growing up in a wonderful household is just one of the millions of gifts I’ve experienced in my lifetime. Life is grand for me, and has always been. Gratitude is the only ultimate, as it leads to kindness and empathy, which ultimately leads to peace. Thanks, Lisa, you’ve made some very good points. So beautifully written and inspirational. Thank you for revealing, again, the elegantly simple, clear path.